Welcome back fam! If you got here, it means that the previous article where we explained the main basics to work on, in order to develop the proper strength and explosiveness needed to achieve the very first muscle up, was already quite useful! Sooo…now we keep goin’ on and, as we promised, we will firstly explain more in depth which other exercises you can work on, in order to be more complete in terms of CNS motor patterns typical of the muscle up and so to make them become “tools” that you can incorporate in your routines. Then, we will also analyze how to perform a muscle up, in order to give you a better idea of how it should look like when the form is clean and when is not. As we explained in the previous article, covering the topic of the muscle up, we stated that it is highly recommended not to attempt to perform it if you haven’t gotten the necessary strength and explosiveness yet. Let’s say first of all that, there is no defined rule to establish if you got or not the requirements to achieve a muscle up, since we are all different in terms of body conditions, genetics, bodyweight and many other variables for whose we cannot indeed establish such “general rule”. From our point of view we would dare saying that, If you want to be safer in terms of preserving your joints from getting damaged with the attempts to perform a muscle up, you should be able to perform the sets and reps as follows without accusing any fatigue at the end. As a matter of fact, and I think that on the point we can all agree, you gotta master the basics! 1 set of 20 bar-hanging leg raises, because the core makes an important role in the movement and in developing the energy between the pulling and the pushing phase, in order to get with the chest over the bar. Let’s not forget about isometrics! Because they also have a fundamental role in building the proper stamina that allows you to hold a position for a longer time range, like for instance when you perform an L-sit pull-up. We are talking about the bar hanging L-sit hold that, at the very beginning it can be approached in its easier version that is with legs not straightened out, but with legs bent in a 90° angle so to lighten the exercise. For instance, at the beginning you can start working monthly for 4/5 sets of 10/15” hold, working all the way up to 3/4 sets of 20/30” hold. In the end, you should be able to hold this easier form for at least 1 set of 30/45”.mAfter that, following a similar path, you can proceed with the full version that is with legs straightened out and follow the same progression. In the end, also in this case, you must be able to hold the bar hanging L-sit hold for at least 1 set of 30”. We do not have to forget, of course, the other requirements we mentioned in the previous article; where we also talked about the combination of L-sit position of the legs (90° angle with legs straightened out) while performing the main basic that is the pull-up or the waist-high pull up (harder). Another point that we wanna emphasize for sure and that probably often is forgotten, is the fact that, a movement like the muscle up, also implies to have a very good shoulders’ mobility because the more you have, the easier it gets to develop the kinetic energy needed to get over the bar after pulling yourself up. Being more flexible and mobile with your shoulders, not only will help you to achieve the muscle up with less efforts and stress, but will also increase their ROM in general, favoring then a better approach of other skills such as the handstand and back lever. Let’s now have a better look at the additional exercises that can be helpful to shorten the time you need, to achieve your first muscle up. After mastering 1 set of 15/20 reps of strict form pull-ups in a row, 1 set of 20 bar-hanging leg raises and 1 set of L-sit isometric hold of 30”, it’s about time to make the thing a little more interesting. In order to do that, we can start combining these three elements and start working on L-sit pull-ups. At the very beginning the point is that, you gotta hold the legs straightened out in a 90° angle for the whole duration of the movement until you get at least with your chin over the bar (and only later on, like we said, with the chest hittin’ the bar). The goal of ” how to do a muscle up” here is to achieve 1 set of at least 10 reps in clean form, without losing the legs on the way. As most of you already know, these two variations of the basic exercises such as push-ups and dips, are representing a very effective one in order to build strength as well as explosiveness that come in handy while performing a muscle up. Just consider the fact that, both push-ups and dips performed in the “Russian” variation are forcing you to involve more the shoulders because of their particular movement. By particular movement, we wanna emphasize the fact that, once you get in the eccentric phase of both types of exercise, instead of having both arms bent in a 90° angle, they will tend to below the shoulder’s line hence below 90°. While performing Russian push-ups, this variation will take you to have elbows and forearms touching the ground for a second before exploding once again all the way forward with your shoulders and then up with your chest and triceps. While performing Russian dips on parallettes, the same principle applies, hence in the eccentric phase elbows and forearms are going to lie for a second on them before exploding all the way forward and up. Russian push-ups can be performed also on rings and it’s worth saying that, like for all the other exercises performed on rings, this one as well becomes as twice as effective compared to performing it on the ground. Here you are forced, as always, to use more your stabilizing muscles and in this case, practically once you are in the eccentric phase, hence when your chest gets closer to the rings; that is the moment that you must then slide backwards with your elbows until they touch the ground. Be careful because here, hands are hanging on rings hence you must have a solid false grip in order to avoid pains and aches in your wrists while performing this variation. It’s worth working on these variations with sets’ ranges between 4-5 x 8-10 reps minimum. As we mentioned also in the previous article related to the muscle up, it’s also possible to include in your trainings and especially in your progressions the use of the resistance bands, to get a closer “taste” of some more advanced exercises. In this case, I’m referring to the explosive pull-ups that, if performed freely without any assistance, are a clear proof of which the level of your strength and especially explosiveness is. Explosive pull-ups require having a solid strength in your lats as well as in your traps. Why do we say that? Because in order to get with your stomach or waist at a bar-height, you gotta consider that after pulling in explosive way yourself up (thanks to the energy developed by your lats) then starts more of a pushing phase where indeed are your traps, rather than your lats, that are involved in making it happen. Now, it’s not even wrong to approach this exercise with a little assistance in the beginning, considering that you can then also change the load and lighten it in order to be closer to its final version, that is indeed without any assistance at all. Explosive pull-ups are a very effective exercise to develop and increase the explosiveness. Before telling you, which could be a possible way to approach them by means of the resistance bands, it’s worth saying that of course you must have previously mastered pull-ups in perfect way as well as dips. You gotta have mastered a high volume in terms of sets and reps of these two basics, otherwise this exercise could end up being counterproductive because of lack of form and proper levels of strength and explosiveness like we said before. Regarding the frequency, I could suggest you to include it in your workouts on a weekly base; you could start by performing 4 sets of at least 3-5 reps of explosive pull-ups with the resistance band that holds around 20 KG and aim to reach the bar at least with your stomach. In this way, you will have an initial help just to get more confident with the movement itself and then, of course, progressively you can go on and start by using the one that holds around 10 KG ending up with the lighter one that holds around 5 KG. I’m not saying anything specific regarding the color each resistance band has, since different companies are making them with different colors to whose are matched different weights’ hold. So, please, make sure to check always this parameter before purchasing any resistance band according to your needs. We think that also this exercise is often included among the most common that are helping to achieve the muscle up. Basically, the first element that you must have, is a waist-high bar or slightly higher, so that you can start the exercise by grabbing it with both hands at a shoulder-width and jump over it like simulating the concentric phase of the muscle up. After landing with your feet on the ground, explode and jump over the bar again for multiple repetitions; of course it’s implied that, the higher the bar, the more difficult the exercise because in that case you’ll have to start pulling and pushing more in order to get over the bar with your chest. If by doing that, you don’t feel anymore the effort you were feeling in the beginning of the journey (when you firstly started this exercise), it means that you can proceed and approach harder complementary exercises in order to avoid plateaus. Regarding the progressions; well, being the exercise more of a dynamic one just to get familiar especially with the concentric phase of the muscle up, you could consider working on it for 4 sets x 5-8 reps. Only after, when you start seeing an improvement, you can raise the bar and aim starting from a higher position with your hands. Since we wanna always make sure to give a new stimulus to our CNS and not get stuck, we can consider to combine a pull-up with a bar- hanging full leg raise, better known as “pullover” and the eccentric phase of the muscle up so to obtain a wonderful and effective transition work! In this way, you will be able to cover different motor patterns, all aiming to develop the strength and stamina needed to achieve the muscle up. Considering the intensity of this exercise, I personally recommend to work on a range of 3/4 sets of 3 up to 5 reps so that, in a row, you should be able to perform at least 1 set of 8 reps. Keep in mind that, such exercise can be performed at different speeds and so, when talking about 1 set of 8 reps, I’m referring to a “normal” speed of execution included indeed the seconds of eccentric. If you aim to perform every eccentric phase as slow as you can, 8 reps in a row will become a very intense workload for your lats, shoulders and elbows; it’s up to you the choice, keeping always in mind that YOU DO NOT WANNA HAVE GAPS IN THE PROGRESSIONS! Here it comes another very interesting as well as very intense, transition work to approach the muscle up! In this case, the first part of the movement is the same so, we gotta firstly perform a pullover as for the previous exercise; the change comes with the second phase. In particular, once you’ve gotten into the starting position of the straight-bar dip (just to be clear, with arms straight hanging over the bar and shoulders depressed) you have to slowly lower yourself down. While getting down, the elbows (possibly not too much in, not too much out in order to avoid stress in the tendons) together with the chest, are lowering at the same level of the bar. From there, perform a short repetition by coming all the way up once again that is, back to the previous position with arms straight hanging over the bar. As you can understand, by reaching a “halfway” between being completely over the bar and being, at the opposite, completely below it, comes hard to hold the body for few seconds in that halfway forcing to use all the strength you have in your triceps, shoulders and chest, so to push up once again the whole bodyweight. Remember also that, while performing this particular exercise, legs can tend to come up in a 90° angle like for the L-sit, it’s not a mistake to use them as a sort of “assistance”. If instead you wanna make the exercise even harder, aim to hold on purpose the legs in a full L-sit position while lowering yourself down at bar-height. Another very effective exercise that helped me a lot to train my CNS to the muscle up movement in its two main phases, is the one performed with the assistance of two bench presses. Think of them as two solid parts on whose you can place your hands, forearms and elbows, of course from the side of them where you usually place the head. The very first time you can regulate the benches’ inclination closer to their minimum range, hence almost parallel to the ground; you can keep your legs bent in a 90° position with feet on the ground (to start with) or also straightened out (a bit more advanced). Focus only on pushing up your upper body by performing a sort of Russian dip, hence sliding forward with your shoulders and elbows that are elevating from the benches like when you are performing a muscle up on the bar where you must get indeed the chest over it. Keep the elbows in line with your hips and after sliding all the way forward, push your upper body up thanks mainly to the triceps in order to go into a full extension of your arms for a while. Then, come all the way back by bending once again the arms, paying attention to focus in this phase to control the eccentric movement so to keep in line elbows and shoulders so to let them lie once again on the benches. All these phases together represent a repetition so, to sum up, start by keeping your legs in a 90° position or straightened out (in both cases with feet on the ground) and slide forward with your elbows, shoulders and chest. Push yourself up by extending completely the arms like performing a Russian dip, from there bend once again the arms with elbows always forming a 90° position and come all the way back to the starting one. In terms of progressions, you could start by performing at least 4-5 sets of 8-10 reps with the easier version that means with both benches flatten, parallel to the ground. Then increase the difficulty by raising more and more the benches until you are not able anymore to place the elbows as well as your forearms on them (45° angle or more) and also your feet will be elevated not touching anymore the ground as assistance. Start by performing 3 sets of 5-8 reps maximum in this advanced phase. As we have seen above for the pull-up progressions, you can consider approaching the bar muscle up with a little assistance provided by the resistance bands once again. In this case, note that, the exercise itself can result being harder than expected. So how to do a muscle up? If you force yourself not to swing before starting the movement, it comes harder to pull yourself up and implies to have mastered a good level of explosiveness. On the other hand, if you consider instead placing both feet on the resistance band and start swinging, after finding the momentum, you will be pulled all the way up over the bar in easier way. Both cases are worth trying in order to understand the differences in terms of workload as well as of coordination. Keep in mind that, the progression here wants the same as for the pull-ups, hence reducing the weight hold of the resistance band starting maybe with the one that holds around 20KG and following the same scale previously showed down to 5KG. You could consider starting with 4 sets of at least 5-8 reps aiming then to reach, with the lightest resistance band, 3 sets of 8-10 reps.
Ok guys! I think that we were able to provide you with an even more complete list of complementary exercises that can truly help you to achieve your first muscle up on the bar. Now it’s time to move on and explain you in detail how to do a bar muscle up! 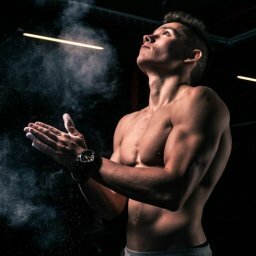 Assuming that first of all you were able to master all the main basics, plus some complementary exercises enlisted above and as we all know, after watching plenty of videos and tutorials on YouTube, you are probably already drunk of seeing the muscle up movement analyzed in depth, step by step. In my personal opinion, it’s never enough to get always a different point of view (when possible) from someone else, so to make comparisons in terms of details explained through the execution of each exercise. 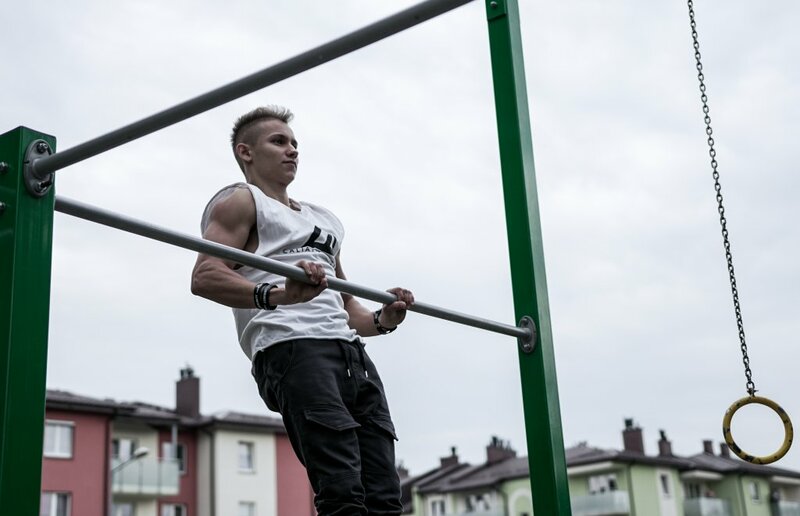 For this reason, we wanna make sure that, after reading this article and mostly the following explanation, you won’t have any more doubts about how to perform a muscle up. We said that in order to perform a muscle up we must, first of all, grab the bar wrapping both hands firmly around it with thumbs in at a shoulder-width. Going one step back before grabbing the bar, in order to start the movement properly, we can suggest trying firstly to do a little jump, considering a couple of steps behind it as a sufficient distance. This means that, after grabbing the bar, you have already a bit of inertia given by the natural energy developed by the jump. Finding your entire body with shoulders forward beyond the imaginary line that the bar forms, that is the exact moment that you have to try to pull yourself all the way up, following an oblique line, not a straight one. In this way, you should then be able to find yourself with the chest at a bar-height and create that momentum needed to get with your chest over the bar, where starts then the straight bar dip phase, which helps to elevate your entire upper body above it. The thing is that, most of the people at the very first attempts, even if they could have already sufficient levels of strength and explosiveness, they don’t get quite clear the coordination to get over the bar and so they get stuck with the chest at it, falling down and failing attempt after attempt. In order to avoid that, you should start indeed trying to figure out, while you perform the movement, how the body has to follow the two main imaginary lines described above. They are the ones that help you to find out which is the exact momentum needed to pull yourself up so to get with the chest over the bar then. An exercise that can be seen as simple, but that in reality is not, which aims to help you find out such momentum consists in jumping, two steps behind the bar, grabbing it so to go all the way forward with your shoulders and coming all the way back just by using the momentum created by the natural body swing. One repetition ends when you come all the way back with feet landed on the ground after releasing the hands from the bar. After a while performing this exercise you should be able to get more familiar with the exact moment you need to find and make yours in order to perform then the muscle up. Dear Fam! I hope that also this time we were able to provide you with all is necessary to always train wisely and with the passion in what we do so to share it with you all. We wanna keep inspiring you to let you find out always the best of yourselves, to make you believe in your potential and to let you achieve new goals every time! Stay tuned of course for new releases since we have a lot going on! MASTER THE TECHNIQUE AND ALWAYS TRAIN WISELY, DO NOT BE IN A RUSH!